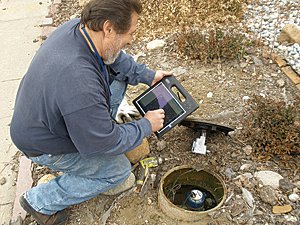 The city of Thornton, Colorado, discovered that if it didn't replace roughly 31,000 aging electronic radio transponders (ERTs) on its water meters, city staff would no longer be able to perform drive-by meter readings. Thornton put out a request for proposal to assist with the interface in the change-out program. "We came across one we liked," said Jason Montoya, utility maintenance supervisor. "But the overall financial implications were too great." The solution they liked would have cost more than $100,000—far more than the city could spend. Consequently Thornton opted to utilize an existing technology for zero cost. "So I sat down with IT and Mary Ann and told them what I was looking for," Montoya said. "They started bouncing ideas, and Mary Ann thought we could do a web-based service." The focus turned to the existing GIS for the solution. The web map took four months from idea to implementation. The only cost to the city was $12,000 for handheld tablets. "We would have had to purchase those regardless," Montoya said. "So there was no cost really."